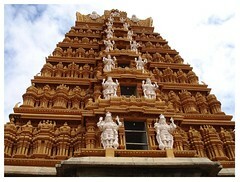 Nanjangud is a temple town situated on the banks of Kapila river and is famous for the Nanjundeshwara temple. The temple occupies a large area and becomes crowded twice a year during the two festivals Chikka jatre and Dodda Jatre. Apt time to visit the temple is during the winter months of September to January. In the Nanjangud town itself restaurants and lodges are available. Mysore being only 20km away can also be opted for stay. Nanjangudu is 160km from Bangalore. Route 1: Bangalore - Mandya - Mysore - Nanjangud. Getting till Mysore is easy in KSRTC from Bangalore. From Mysore there are many KSRTC buses to Nanjangud.